This article was authored and published by MIM-Prisons. Recently comrades at Anti-Imperialism.com have brought up the question of how First Worldism sets back the revolutionary movement within the oppressor nation itself. (1) When anti-imperialists begin banging their heads against walls of cops, it seems a good time to consider this question. Over the Amerikan KKKolumbus Day weekend, a series of anti-colonial and anti-capitalist demonstrations were organized on the west coast. Judging by the turnout and support, there is not a big anti-colonial movement in the United $tates. This is no surprise, for it is the most powerful imperialist country in the world. One anti-colonial march in San Francisco was dwarfed by the crowds of consumers, shopping on a Sunday afternoon. The organizers showed little interest in reaching out to the shoppers, and more in smashing symbols of wealth and exploitation. An hour pre-march rally seemed hardly noticed by the shopping masses. And the march itself lasted only a few blocks before violent clashes with police left 22 people arrested. A significant loss from a crowd of maybe 150 who had just begun to unveil its message. The lack of interest in reaching out to the shoppers may reflect a correct analysis among the protestors that those people had no interest in or alliance with the message of their march. But if so this line was not put out publicly in literature or banners. We will argue here that doing so would have done more to promote divisions among the pro-imperialist camp, whereas the tactics of the day instead have helped consolidate those forces in recent years. Last fall, thousands and thousands of Amerikans, primarily youth, rallied to the call to Occupy Wall Street, which evolved into Occupy Everywhere — a rather frightening slogan for the youth of the number one imperial power to take up. More progressive, and often more experienced, poles in the movement steered things in an anti-occupation/anti-colonial direction. But somehow this wasn’t as appealing to the Amerikan youth as rallying for more jobs, free schooling and better interest rates on loans. If we eliminate the flow of wealth from the neo-colonies, the people in this country will lose their high paying jobs and easy lines of credit. Despite this self-evident truth, there is still not a strong voice drawing a clear line between those who benefit from imperialism and those who suffer from it. In practice we see lines being drawn, as the more radical messages seem to accompany some tactics that trigger anger from the Amerikan “middle class.” There continues to be backlash in some instances of calling those who vandalize property “terrorists” while telling them to target bank windows rather than their nice neighborhood. We have little interest in the petty bourgeois debate over what is okay to smash, but this whole debate serves as a convenient excuse for the Amerikan left to ally with the imperialist state. What needs to be challenged is the idea that the Amerikan “middle class” somehow deserves more than everyone else in the world and therefore is not the enemy like those evil bankers. Interestingly, the bourgeoisie gets away with attacking those who act against the interests of the “middle class” as “outside agitators” and “spoiled white kids.” This name calling serves as a distraction from the issues being demonstrated around. Of course there will be anti-colonial struggle in white faces in a white country. To argue otherwise is to breed confusion. While we believe there is more anti-imperialist potential here in the United $tates than those who showed up this weekend, particularly among the internal semi-colonies who were sparsely represented at these events, the dominant ideology of this country is pro-middle class, which is pro-imperialism. Even the most radical Black organizations out here will say that “white people are exploited too.” Yet the truth is the complete opposite: Black people aren’t exploited either in this country. The sooner we all start being accountable for what we have, the sooner we can take a realistic approach to what we can do about it. We need a strong line that says, yes, the petty bourgeoisie and the labor aristocracy in this country are the enemy of the world’s people. Just as MIM has always attacked identity politics, this does not mean that petty bourgeois people cannot be anti-imperialists. We welcome and honor those Amerikans who choose to stand with the exploited peoples of the Third World. But let’s make it clear that doing so requires opposing your own class interests. After we draw that line, maybe we can think of ways to actually attack the interests of the exploiter classes, rather than just attack their symbols. Boots Riley, Oakland rapper and activist, has criticized the tactics of vandalism for alienating the majority in the city. (2) There is some truth in what he wrote in that we should not be helping the petty bourgeoisie unite with the imperialist state in opposition to anti-colonial voices, at least not without making significant gains somewhere else. Instead, we should be driving wedges between the various class alliances of our enemies, creating cracks in the system that make a little more room for the oppressed to move and organize. And perhaps ironically, pointing out the unity of the material interests of almost everyone in this country with imperialism can contribute to creating these cracks among those who have subjective moral objections to living off the suffering of others. We do not believe that moralizing will “wake up” the Amerikan people and end this system of exploitation. We recognize there is no winning the majority in this country. So it is a question of recruiting the minority that care or suffer greatly under this system and promoting disunity among the rest. Finding effective tactics for either is our challenge. 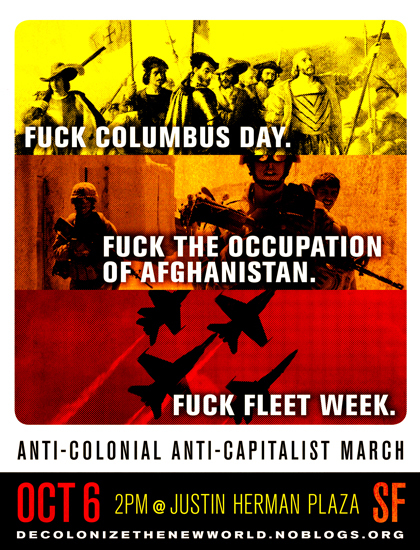 Before we split the anti-imperialist camp over what we should do after the revolution (where we differ with the anarchist majority at this weekend’s events), let’s split with those who will organize and fight for the deepening exploitation of the Third World to feed the over-consumptive, privileged lifestyles in the imperialist countries. And let us be honest with our fellow exploiters, breaking the illusions of an alliance between First World social democracy and the interests of the exploited and oppressed. The one cannot exist without the other. The clearer we are about that, the more Amerikans are forced to make the choice between committing daily violence through their privilege and becoming a virus within the matrix.